James Malm, an independent internet poster and leader/owner of the Shining Light blog, is now apparently trying to boast that he has the number one COG News site. Please do visit the Number One COG site for the news that counts and its prophetic implications. He was referring to his tomorrowsnews.net site. 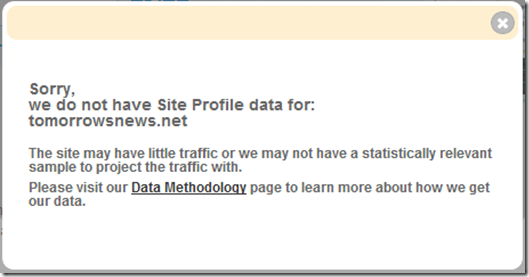 But the simple fact is that James Malm does not now have the most popular COG news site and never has. 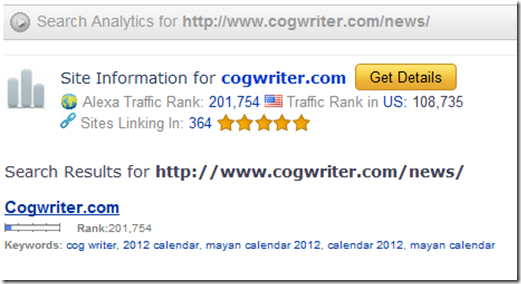 James Malm’s Arrogance and Who is the “Number One COG Site”? It is becoming more and more obvious that James Malm’s delusions of grandeur know no end. He thinks a “certain blogger” is “dedicated” to attacking his site, when in reality, Church of God Perspective is dedicated to the truth, which is something that he cannot fathom because he is a liar and the truth is not in him. He is not the only liar I have exposed on this site, although I try to concentrate on promoting the truth rather than correct the hundreds of errors that false teachers promulgate. If it seems that he gets more mention on here than others when it comes to exposing deceit, then the reason is obviously because his teachings are more error-ridden than most others. Really? Where does he get his “facts”? As of today, what do the real ranking sites show? 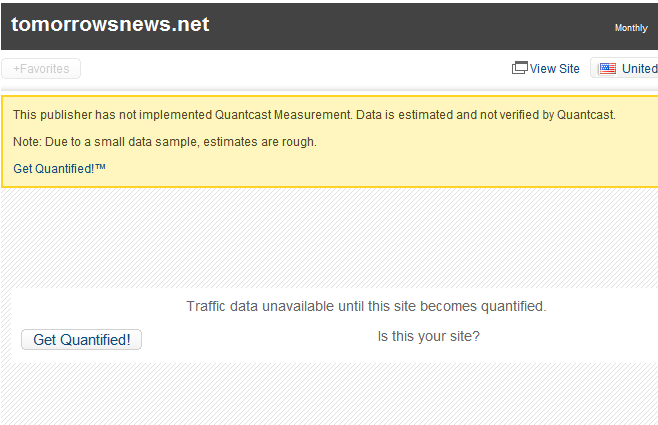 This site, in comparison, needs to be quantified as well. OK, I’m a slacker, but I’m now rectifying that situation, although it isn’t a news site and wouldn’t be a comparison to begin with. How about a real COG news site? 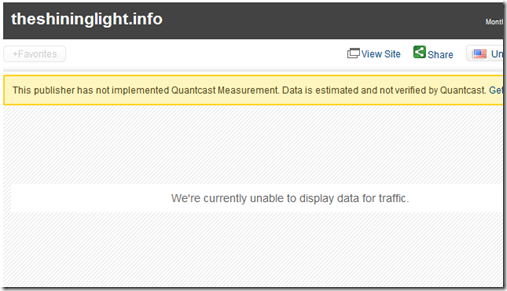 There are pluses and minuses of using Quantcast, so what about Complete? 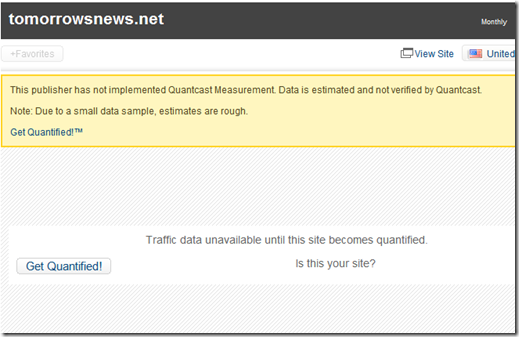 Arguably, it is more accurate than either Quantcast or Alexa. 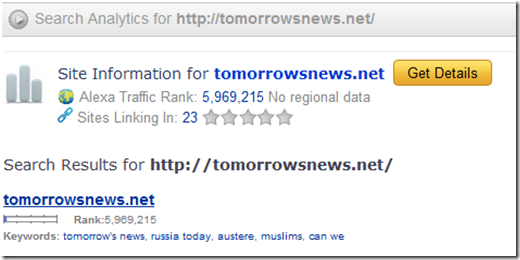 Not looking like the Tomorrow’s News: Today! site is faring so well for a “number one COG site for the news”! Well, OK, what about Alexa? Personally, I think their ratings are skewed, but some people put stock into what they publish. Ouch! 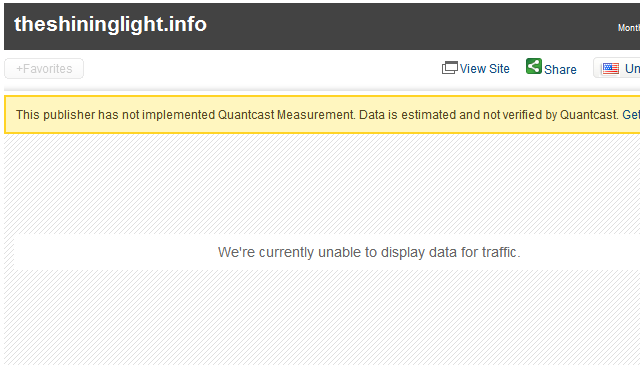 At least The ShiningLight ranks 789,041. And, COGWriter? Not only is Malm playing a silly game, but he is arrogant enough to lie about it. HWA used to warn about majoring in the minors. I always have to step back and consider the attitude whenever someone makes a mountain out of a molehill, and Malm does this a lot. Even worse, he will totally ignore anything that contradicts his notions once his mind is made up, and it doesn’t matter how small or minor the issue is. I was not going to post about this, but decided that since this false claim is so clear and obvious, that perhaps this could open the eyes of some of James Malms’ followers. James Malm simply does not have the position as he claimed. Now, while he will probably claim that his is number 1 for prophetic news that counts, as my articles throughout the years about him demonstrate (e.g. Error-Ridden James Malm Not Doing an Elijah Work), he has repeatedly been proven wrong on matters prophetic, and (other than typos, etc. 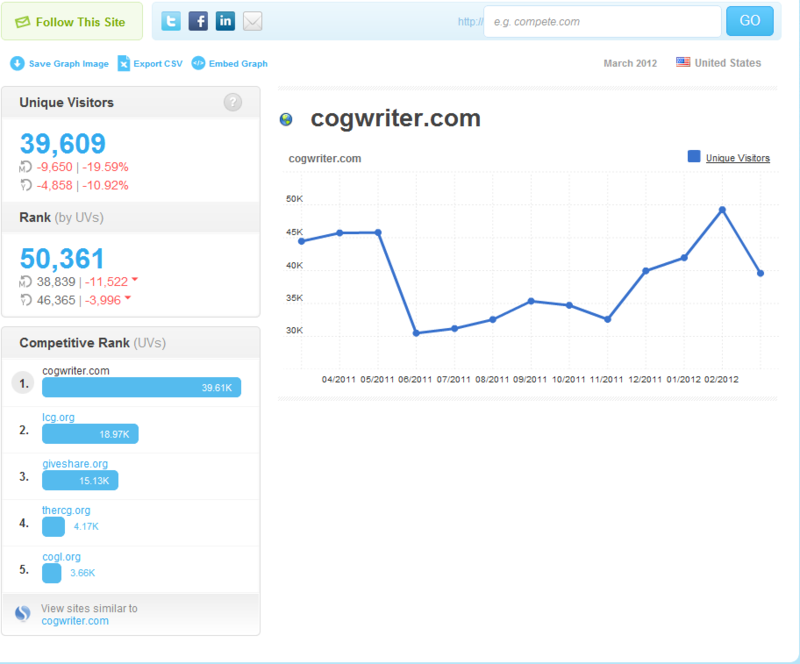 ), COGwriter has never thus far been wrong on such matters. 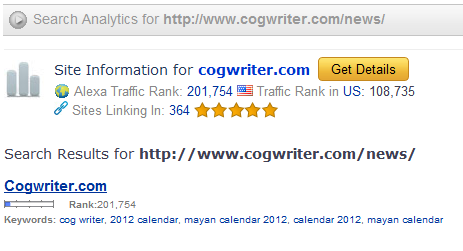 Now, while it is true that there are problems with independent ranking sites (for example, the LEAST number of unique visitors to COGwriter.com for any month in 2012 was over 86,000), the fact is that James Malm is tooting a strange horn. In one of the first emails he sent me years ago (probably in 2007), James Malm tried to assure me that he was not like Ronald Weinland, well he seems to have prophetic, governance, and other problems that remind me of Ron Weinland. Hopefully, his followers will not be like those of Ronald Weinland, and keep following him even when he is clearly proven to be wrong, like this false boast proves. And James Malm is also wrong about the Great Tribulation possibly starting in 2012. So, James, do not be like Ronald Weinland and tell everyone now that you are wrong instead of later claiming that you only said that there was a 70-80% chance that the Great Tribulation would begin in 2012. Doug Winnail is warning his LCG brethren to beware of false teachers and suggesting that everyone study the scriptures to see if things are true. I strongly advise everyone to follow his recommendation and certainly DO study the scriptures with an open mind as opposed to trying to prove a preconceived agenda. Of course he means to study with the preconceived agenda of proving their traditional explanation of the scriptures correct, instead of an open minded seeking of the truth of God and studying to prove ALL things as to whether they be so, FROM the Holy Scriptures. I will explain how this attitude prevents any spiritual growth in the major COG Groups in the coming post on Doctrinal Committees. While obviously some in LCG have seen his blog (obviously I have or I could not report about it as I have), to suggest that Dr. Winnail posted the above because of him is the peak of arrogance. James Malm was not the primary purpose of that post. James Malm perhaps forgets that Dr. Winnail, Dr. Meredith, Richard Ames, and I were all declared to be part of the “Synagogue of Satan” by RCG’s David Pack a few days before Dr. Winnail published that (see RCG’s David Pack Says COGwriter, Dr. Meredith, COGs, etc. ‘Part of Synagogue of Satan’). I will not go into more details now, other than to say that James Malm seems to be grasping at straws to declare his self-importance. 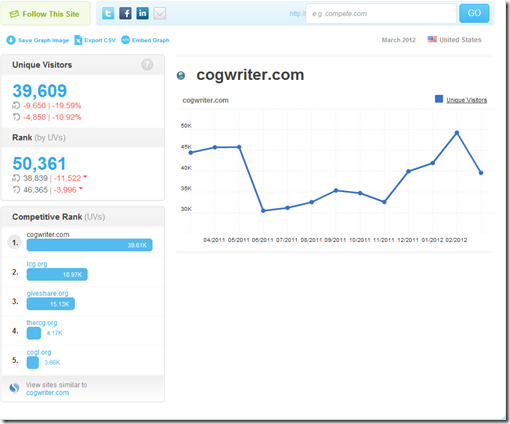 For the same month, November 2012, COGwriter.com had Unique Visitors 124,918; Total Visits 197,323. James Malm has made a lot of false claims, assertions, and implications. Those interested in the truth will not rely on him for much. Concerns About Ronald Weinland’s Church of God-Preparing for the Kingdom of God Ronald Weinland falsely claims to be one of the two witnesses God is raising up, that the Great Tribulation began on December 14, 2008, and that Jesus will return on May 27, 2012. Why does the Bible show that Ron Weinland is a false prophet? He has other views which show he is not part of the Church of God? This entry was posted on Sunday, May 6th, 2012 at 3:21 am	and is filed under COG News, Religious News.